What does בי in בירבי mean? The word בירבי "the son of Rabbi..." appears many times in the acrostics of piyyutim (e.g. El'azar the Kalir signs his name אלעזר בירבי קליר, e.g. in the יוצר beginning אומן בשמעו). (I have seen it often in prose as one word, though the acrostic allows for a reading of בי רבי). In the Yerushalmi there is an amora by the name of רבי יוסי בי רבי בון (e.g. Berachot 1:1, with בי רבי as two words), while the Bavli sometimes uses ברבי (e.g. Berachot 5b). All of these words seem to be the same despite the variants in spelling. My question is: What is the meaning of בי? It seems to refer to the father, but the word for "son of" in Aramaic is בַּר, and that doesn't explain the letter י if בירבי is abbreviated from בר רבי. Is it an abbreviation of the word בן רבי (leaving out the נ)? Or could it derive from the Aramaic word בי, meaning "of the house of..."? 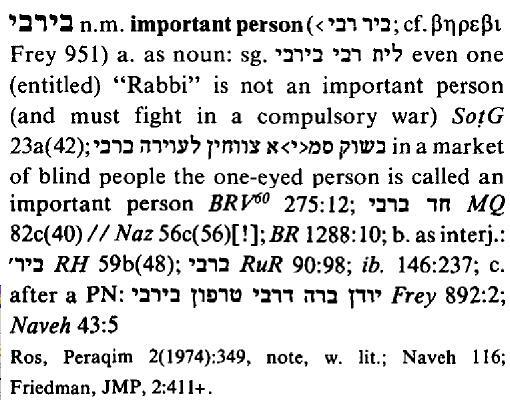 some of the fathers of the people who have Beribi after their name were not Rabbis. The Yerushalmi, where most of the Beribis are, only uses Ben or Bar to mean "son of"
He therefore follows Rashi (noted by Aruch in Oliver's answer above) in many places (see inside Sefer for various locations in Rabbinic literature), that it means a "great man", not "son of...". 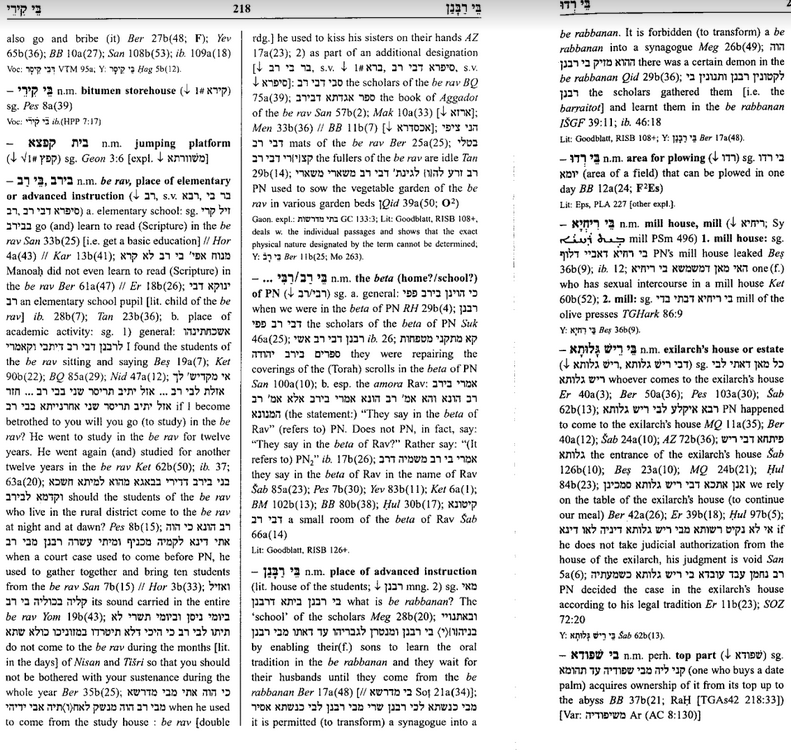 He concludes by saying that when he has time, he will discuss why Chazal chose this title for an Adam Gadol, (but I have been unable to find this anywhere). As to beribbi: although it indeed means “the son of a rabbi”, it had also a formal meaning. It designated the children of the rabbis [beneihem shel ḥakhamim] who were studying at the yeshivah and its use was restricted to the period before they achieved full rabbinic status. The download of Lifshitz's full book review is available at the link above, and lists some of the proofs and discussion of "Beribi" meaning son of "Rabbi". Side note: If anyone has a subscription to Kotar and can look up any of the articles and summarize the arguments, suggestions, and findings in detail, that would be fantastic. Following Rashi in numerous places, the Aruch HaShalem (vol. 2, pg. 183) posits that ברבי means (son of) a great man of the time. The eminent scholar and philologist Saul Lieberman (Tosefta Kefshutah vol. 5 pg. 1062 n.68) likewise maintains that ברבי = Bηρεβι, and means "בן גדולים" (son of great/distinguished one/s). Zecharia Frankel (Mavo HaYerushalmi 70f.) concludes the same in that the meaning is as defined by Rashi; an honorary term for an individual of distinction. Alternatively, in a certain context of Yerushalmi it also assumes the meaning of "students of the yeshivah". Prof. M. Margulies (Vayikra Rabba pg. 584 note 5) admits in the given context of the midrash (25:8) that ברביי means בר/בן בית (household member). So Sokoloff believes that בירבי comes from ביר רבי. As mentioned by others, the Greek form βηρεβι appears in an inscription from Jaffa (see CIJ II no. 951). Likewise, the Aramaic form בירבי appears in CIJ II 1165 and in an inscription from Susiya. Regarding the former inscription, Avigad (Beth She‘arim III) argued this form is a contraction of of בן רבי. Unfortunately I do not have access to this reference at this time. The spelling ביריבי is found on inscriptions CIJ II 893 and 1042. Not the answer you're looking for? Browse other questions tagged talmud-gemara song-poetry language acronyms . What does דשלהי stand for? What does אחדשה"ט stand for?